Hey, sorry for the lengthy delay in updating this blog. My work situation got terribly busy and the airplane projects took the brunt of it. But rest assured, slow progress has been made. As mentioned earlier in the blog, there are lots of tubing clusters to be welded. Fresh tubing from the manufacturer is dirty. There is oil, rust and scale on the tubes. You can't effectively weld it that way. So I wanted to show you how I solve the problem. I bought a cheap portable sand blaster from Harbor Freight. When I decide which cluster I want to weld, I blast it clean. One tip - I used ordinary play sand, the kind you get at Home Depot and found in a child's sand box. If you use the sand right out of the bag, little bits of rock will clog the gun. All you have to do is sift the sand though a kitchen strainer, the wire mesh kind, into a bucket. the rocks get trapped and you have good blasting sand. OK, back to work. the fuselage was flipped over and the upper longerons were welded to the spider plate. Using a big piece of angle iron, the upper spider plate was held straight as the upper reinforcement was set in place. 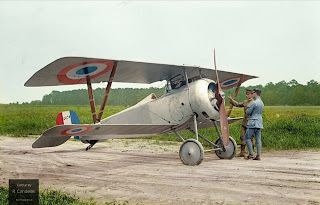 Now that work has returned to normalcy, I hope that the Nieuport progress resumes it's previous pace. 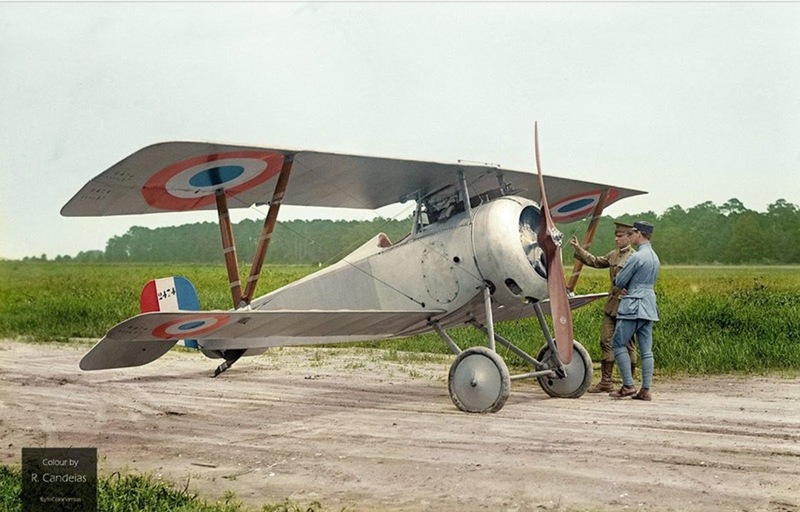 Before I go, I wanted to share this awesome colorized photo of a Nieuport 17 posted on a Facebook website. Hope you like it. I also wanted to share with you a new book. My friend Mark Wilkins recommended it to me and I wasted no time ordering a copy. What I liked about this book the most was the "then and now" photos. 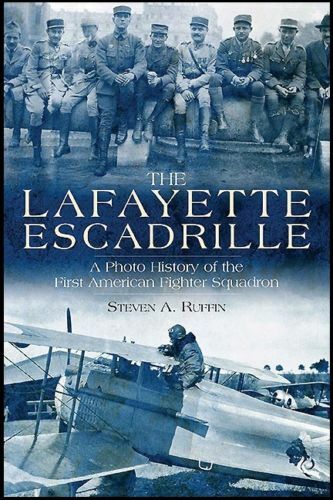 The author traveled to France and retraced the steps of my heroes in the Lafayette Escadrille. I would highly recommend this book ! !